FREE delivery to United Kingdom in 6 - 8 working days. 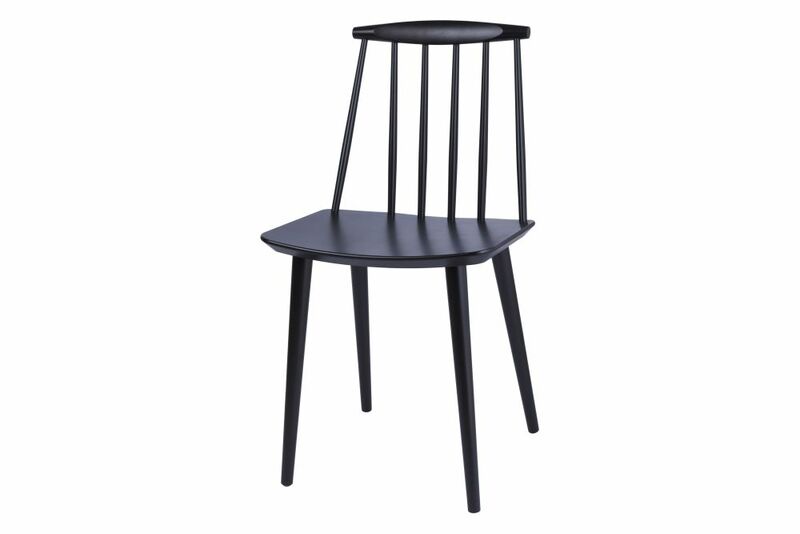 J77 dining chair is part of HAY's 2011 relaunch of the Danish furniture classics originally made for DB (The Danish Consumers’Co-operative Society). Folke Pålsson’s J77 dining chair has a wide seat and curved spindle back for optimal comfort, while the slightly conical legs create extra stability. HAY’s relaunched version is crafted in solid beech with a natural finish or choice of different lacquers. Folke Pålsson is a Danish designer who worked at the FDB furniture design studio in the 1960s. His J77 chair is recognisable design classic all across Scandinavia for its light, comfortable, well balanced design. FDB (Fællesforeningen for Danmarks Brugsforeninger) is the Danish Consumers Cooperative Society, more widely known as Coop. The FDB furniture department played a pivotal role in revolutionising the industry in Denmark, it was founded in 1933 and in 1942 Børge Mogensen was installed as design director. His pioneering approach was distinguished by a desire to create simple, elegant and practical design intended for mass consumption. The Folke Pålsson J77 chair is now produced by HAY, in a range of colours.